The Park offers both a Junior Ranger Program and a Little Ranger Program for the children. Ages 7 to 12 can complete a workbook and earn a patch, certificate and membership card for the Junior Ranger Program. 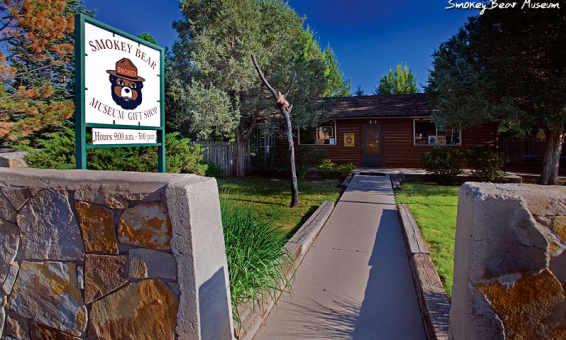 Completed in 1979, the Park was established to honor Capitan's favorite son Smokey, the little bear cub that was found with burned paws after a 17,000 acre forest fire in 1950 on the Capitan Mountains near Capitan, New Mexico. After living in the National Zoo in Washington D.C. for 26 years, Smokey passed away and was returned to the Village of Capitan to be buried at what is now the Smokey Bear Historical Park. Featured in the visitor center are exhibits about forest health, forest fires, wildland/urban interface issues, fire ecology, the history of the Cooperative Forest Fire Prevention Program and a theater showing a 10 minute film discussing today's fire and forest health issues. An outdoor exhibit features six of the vegetative life zones found in New Mexico, an outdoor amphitheater that is used for educational programs for school groups and the final resting place of the "living symbol" Smokey Bear. Also located at the park is a playground, picnic area with group shelters and the original train depot for the Village of Capitan. The Smokey Bear Historical Park is located on highway 380 (better known as 118 W. Smokey Bear Blvd.) in the heart of the Village of Capitan and is open everyday of the year except Thanksgiving, Christmas, and New Years day. Hours of operation are 9:00 am to 5:00pm. Mountain Time. Entrance fees into the park are $2.00 for adults, $1.00 for children 7-12. Children 6 and under are free. Smokey Bear Historical Park is operated by EMNRD-Forestry Division. The Park offers both a Junior Ranger Program and a Little Ranger Program for the children. Ages 7 to 12 can complete a workbook and earn a patch, certificate and membership card for the Junior Ranger Program. The younger children, ages 6 and under, can complete a one page worksheet for a comic book and sticker. Both programs are specific to the exhibits at the park and teach the fire prevention message along with interesting and educational information about Smokey Bear and the Park.